You will need the following to do an oil change. Below are the three easy steps you need to follow to replace the engine oil in your car (oil change)..
Before you start make sure you are wearing overalls, or old clothing. Make sure your hand brake is on and your car is in park, (Auto) or in gear (manual transmission). Jack your car up to the required hight so you can fit underneath it. Place some bricks under the car on each side to support the car at the same height as the jack. Find the correct sized socket for your ratchet, or ring spanner size, by checking it on the plug on the button of the sump. Place the oil pan under your car directly underneath the sump plug. Undo the sump plug and. Drain the oil until it stops running; this should take about 5 – 10 minutes maybe more for a larger car. While the engine oil is draining, undo the oil filter that is attached to the side of the motor with an oil filter clamp. Also undo your oil cap that’s on top of your motor. It is best to drain the oil from the motor while the engine oil is warm, but if it is hot you will need to be very careful not to burn yourself on the hot oil of motor. Make sure the oil filter rubber “O” ring and the engines mating surface are perfectly clean. 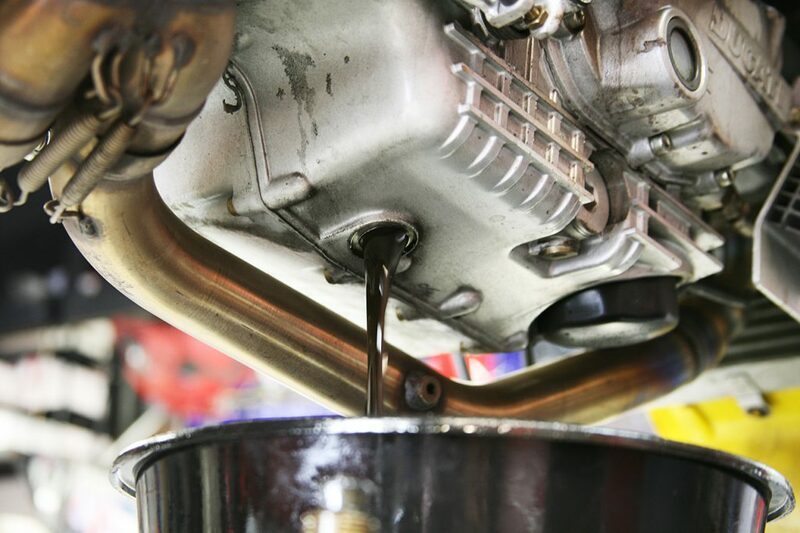 Place a small amount of motor oil on the “O” ring of the oil filter. Clean the drain plug and the drain plug hole surrounds of the engine. Replace and tighten the oil filter. Take the oil pan out from under your car. Put the sump plug back onto the sump do not over tighten the plug. Fill your oil up using the funnel until its full then run the car check your dip stick to see if your oil is still low then fill it up again if needed check your dip stick again. Check to see if there is any oil leaking form the side of the engine block. Replace the oil cap on top the engine. Make shore there are no tools under your car. Remove bricks from both sides of your car. Lower the jack down slowly and your done. Well done! By doing an oil change your car will preform better and there will be less wear on your engine in the long run.By doing an oil change your self you will save between $30 – $70 dollars. And you can now spend that money on something else. Note: do not attempted to do this service if you are not confident. Car parts plus does not take any responsibility for how this information is used and accept no responsibility for loss of expenses.